Dubai, UAE, January 24, 2019: Eberhard & Co continues to surprise with their new outsize mechanical chronograph, the Chrono 4 Grande Taille, buillding further on the innovative Chrono 4's new interpretation of reading time. Now the outsize chronograph comes in a Limited Edition of 600 with a black stainless steel case and black rubber strap, which gives it a decidedly sporting look, emblazoned as it is with E in relief on the side - the emblem of the maison. The generously dimensioned case (Ø 43mm) hides a mechanical movement with automatic winding. Like all the other Chrono4 models by Eberhard & Co. it is characterized by an exclusive feature: its four counters are arranged in a horizontal row, which makes reading the time a logical and consequent operation. The display follows a natural progression of time: minutes and hours hand, 24 hours and small seconds hand. 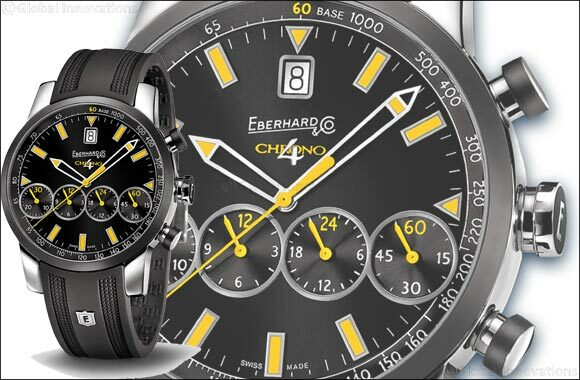 The Chrono 4 Grande Taille also uses rubber in the crown with an “E” in relief, standing for Eberhard, but also in the push buttons where the material adorns the circumference. The watch is protected by a non-reflecting sapphire glass, and it is water-resistant up to 5 atm. The stainless steel variant is available with a black rubber strap featuring as a special adornment an “E“ in relief on the side, the well-known emblem of the Maison.